The Hart and the Hunter at the Palihotel serves up Southern food with both Southern Californian and Pacific Northwest flair. 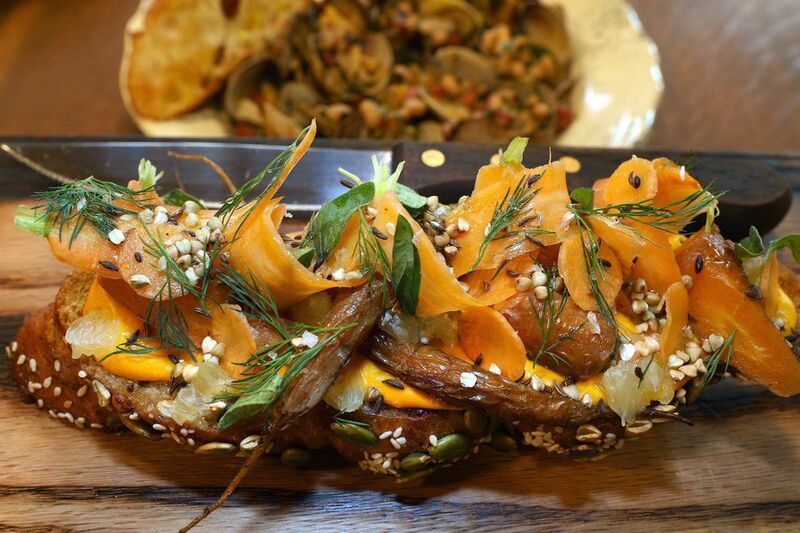 Some of its dishes, such as carrot tartine, were hits. But the restaurant came up short in certain other aspects of the dining experience. But carrots? On toast? Who gets excited about that? Trust me. Try it. The toast is a thick slab of Macrina Bakery’s six-grain, seeded volkhorn lavished with carrot butter. Prettily arranged on top are soft carrot chunks, some toasted buckwheat grains, plus raw carrot ribbons dressed in cumin, lime and fresh dill to counter all that’s sweet and rich. Every bite thrilled. There were other enthralling dishes on the Southern-by-way-of-SoCal menu, some memorable cocktails, too — and I love the updated diner atmosphere — but there were also some food flops and service snafus. Overall, the restaurant lacks the assurance you’d expect from the sequel to a long-running L.A. venue. Like its California sibling, the restaurant resides in the Palihotel, one of those boutique inns that are multiplying in Seattle as fast as bike lanes. The four-story brick building at First and Pine, once known as The Colonnade, is a city landmark that dates to 1900. The black-and-white checkerboard tiled floor, distressed paneling and whitewashed concrete walls suit that century, just as the plethora of coat hooks and plug-ins adjacent to the retro lunch counter, round cafe tables and booths-built-for-two suit this one. Los Angeles-based executive chef Joey Elenterio oversees both kitchens. Both menus lean toward Southern-influenced dishes with some local customization. 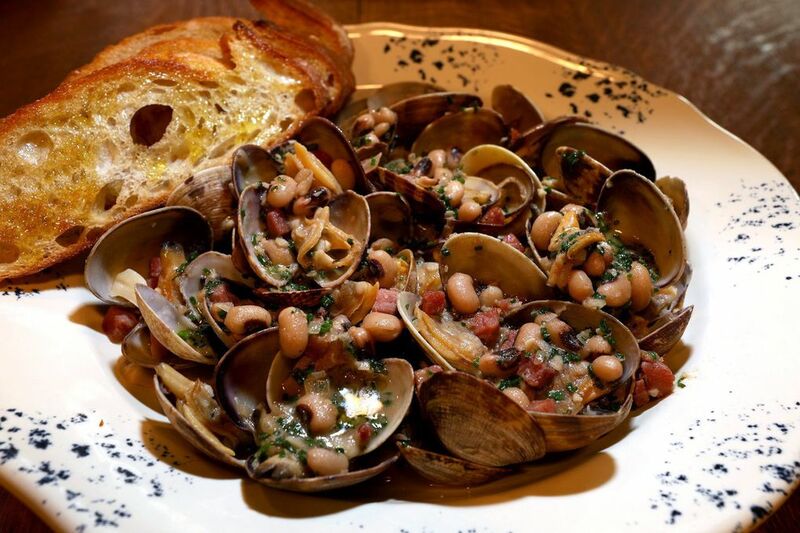 Wonderful little neck clams from Dabob Bay are steamed with black-eyed peas, country ham, lots of herbs and a little crème fraîche. Salmon appears three ways, including as salmon jerky: four delightfully sweet, surprisingly supple morsels zingy with Korean chili flakes. The jerky is billed as a snack. So are “cracklins.” The menu does not mention these aren’t pork cracklins but fried chicken skin: six pieces, each the size of a Frito, but as flat and fragile as spun sugar. For reasons I cannot quite fathom, they are meant to be dunked in a pot of melted honey butter, spiced with cinnamon. I wouldn’t bother. A kale salad and a grain salad is a nod to California, but the unorthodox Caesar goes global with Spanish boquerones whipped into the creamy dressing, and slivers of Italian speck ham and Hook’s cheddar from Wisconsin on top. It was a winner. 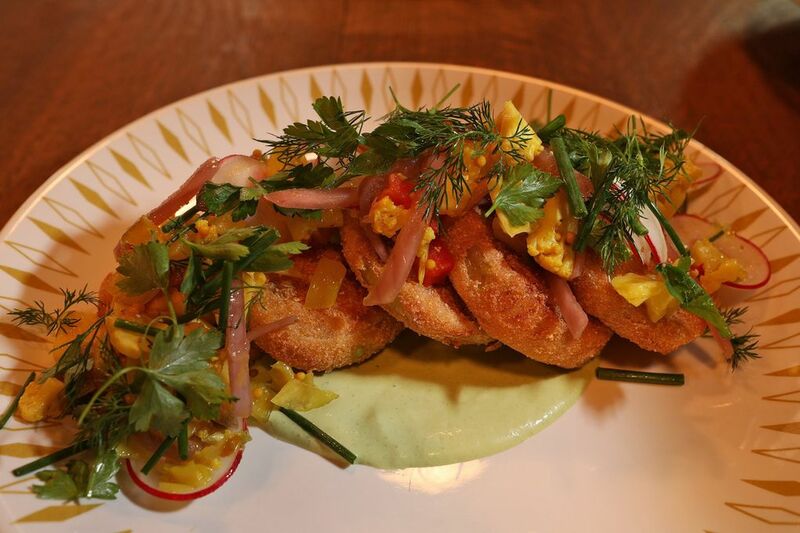 So were crisp, meaty slices of fried green tomatoes that might have come straight from the Whistle Stop Café cookbook. They are paired with green goddess dressing and glorious chow chow, a hot pickled vegetable relish with a preponderance of cauliflower. Delicate ricotta dumplings with bits of smoked chicken and mushrooms nearly submerged in rich chicken broth tasted like pure Southern comfort food. Ditto for bacon-flecked collards and grits creamed with Parmesan, two side dishes worth considering. Skip the blackened shrimp with grits though; the shellfish were few, small and tough. I craved the creamed corn and pimento grilled cheese sandwich from the moment I set eyes on the lunch menu. It oozed to the occasion with a sweet and tangy filling that escaped the boundaries of the thick-cut sourdough. (All the bread here is from Macrina Bakery). The hot chicken sandwich is neither the currently fashionable, fiery Nashville version, nor the gravy-smothered, meat-and-white-bread version of my Yankee youth. It’s a skinless, boneless, breaded cutlet stuffed into a soft bun with plenty of no-holds-barred aioli and house-made pickles. In its humble, unassuming way, it’s a star. So is the burger. The smashed and griddled patty blends sirloin and chuck, giving it integrity and flavor. They ask how you like it cooked (pink or no pink) and deliver it that way, with cheddar, slivered lettuce and those excellent pickles. (Note to chef: Maybe cut the pickles thinner for sandwiches?) I did not care for the smoked BBQ mushroom sandwich, though it’s a promising idea for vegetarians. I found the sauce nondescript and the mass of oyster and beech mushrooms, coupled with less-than-crunchy buttermilk slaw, unappealingly mushy. Making matters worse, the bun tasted stale and the American cheese had congealed before it got to the table. Sandwich prices include shoestring fries, seasoned liberally with Louisiana-style crab boil spices. I never had a batch that was less than perfect. If you give a gal a salty, spicy snack like that, she’s going to want a drink. The libations list is longer on cocktails than wine or beer. I could happily perch at the six-seat bar, peering out the window between booze-lined shelves, sipping an Elliott Bay Gibson made with Plymouth gin infused with oyster shells. It’s a bit briny, mellowed with sherry, and smoothed with a drop of bay leaf oil. Horseradish and chilies infuse the vodka for a Bloody Mary that hits all the key notes but nixes the usual froufrou garnish in favor of a simple lemon wedge. On a darker note, the Pine St. Old Fashioned laces hundred-proof Old Overholt Bonded Rye with coffee-coconut syrup and cardamom. It would be an ideal match for the “mud pie” — warm dark chocolate cake adorned with an elegant peanut butter quenelle, crunchy with flaked feuilletine (fancy French cookie crumbs). The restaurant is a comfortable place to hang. At lunch as well as dinner I saw people working on laptops. Chances are they don’t notice or particularly care that service can be lackadaisical. That there may be no one to greet you, no pepper in the pepper mill, no sharp knife or napkins forthcoming. That empty plates aren’t bussed before the next round arrives. That the flowers on the tables are drooping from lack of water. That a customer must wave across the room to catch a waiter’s eye, and it’s not even a crowded room. There is a lesson in the fable behind the restaurant’s name. “The Hart and the Hunter” is Aesop’s tale of a stag who admired his handsome antlers but disdained his spindly legs. Yet, his powerful limbs propelled him to safety when he needed to escape predators, while the antlers got tangled in the trees. The moral: We often don’t appreciate what is most valuable. For a restaurant, that’s the customer. This Hart and the Hunter has many fine points, but it’s still finding its legs. Providence Cicero: provi.cicero@gmail.com; on Twitter: @provicicero. Providence Cicero is the Seattle Times restaurant critic.